How many of us made a resolution to become more organized? I must say that I love to organize. My family will tell you that at one of my childhood birthday parties, I had the thank you notes written before the guests arrived! So, I got to thinking. How is my home organized to promote reading? Here is a look at how I’ve organized things for my boys (9 months and 2 years) to interact with reading material throughout the day. 1. Make books accessible every place the kids will be throughout the day. Every room we are in during the day has books available. Yes, even the bathroom! Athough my boys are still in diapers, we all know moms seldom get to use the restroom in peace. It’s nice to have some books to occupy the little ones whilethey wait. We even have books for the bathtub! You want the books to be within reach for your toddlers so they don’t try to climb the shelving to get a favorite book. 2. Make “homes” for the books. Ok, my 9 month old’s favorite thing to do right now is to pull everything off shelves and out of drawers. However, at periodic times throughout the day, we put everything back in it’s home. Every room that has books, has a book home. 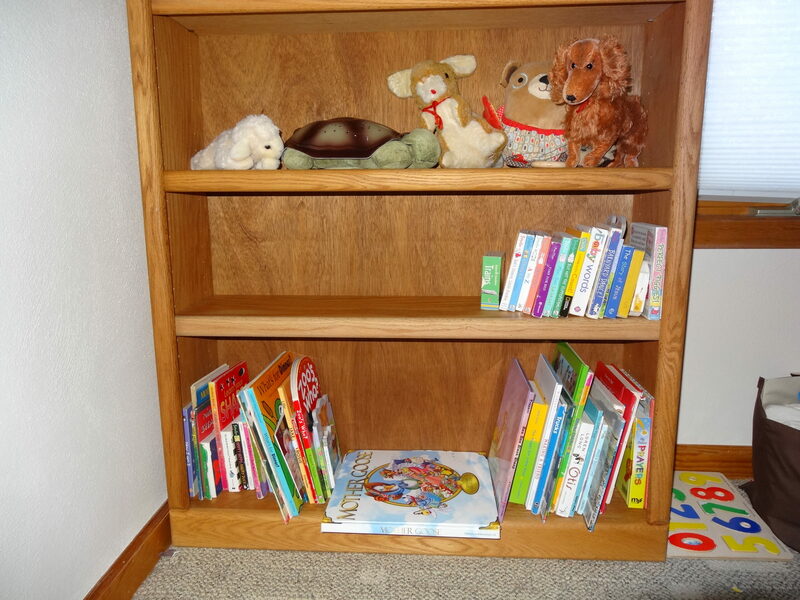 Each of the boys’ rooms has a bookshelf. I highly recommend a bookshelf with a back. Other rooms have baskets or a designated spot to stack books. A back on the bookshelf is important. At this time, most of our books are board books. Other than having a spot to be placed, that is the extent of how they are sorted. When my kids get older, we will utilize a few other organizational tools. I’ll be sure to share those ideas too. We have lots of books that I have collected over the years. (If you are looking to increase your book collection, you might enjoy the post I did last year on building a library on a tight budget.) Too many books out leads to a mess. I store seasonal books in my office. I took diaper wipe boxes and cut out one of the short sides. Then I covered the box with seasonal wrapping paper. Finally, I taped all the edges with colored masking tape. Clear packing tape would work too. These work really well for me since my office shelves don’t have a solid surface. Turn a diaper wipe box into a seasonal book holder! 4. Designate a place for public library books. With a new library card in hand, we now make lots of trips to the library. We keep a canvas bag in our coat closet to transport books back and forth. 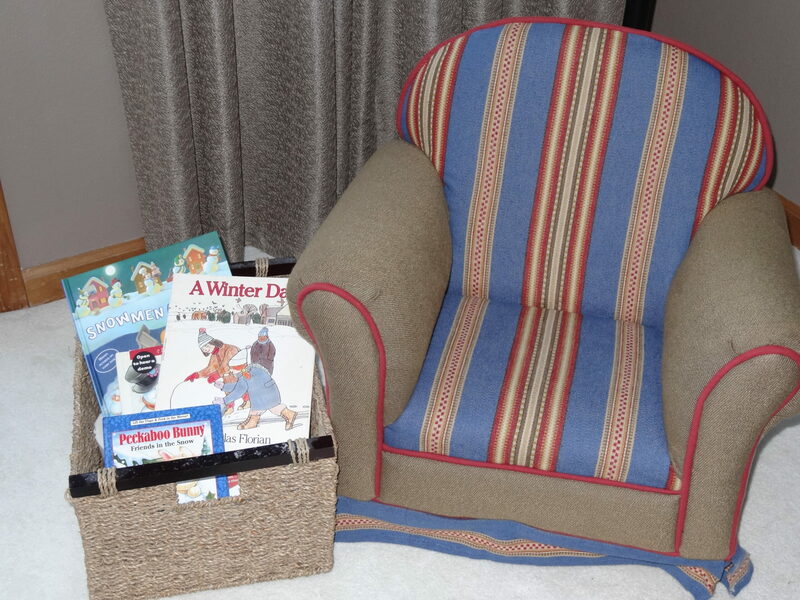 At home, we have a special basket that these books can call home. It really helps to keep the library books separated from your other books so that you can find them easily when it’s time to return them. 5. 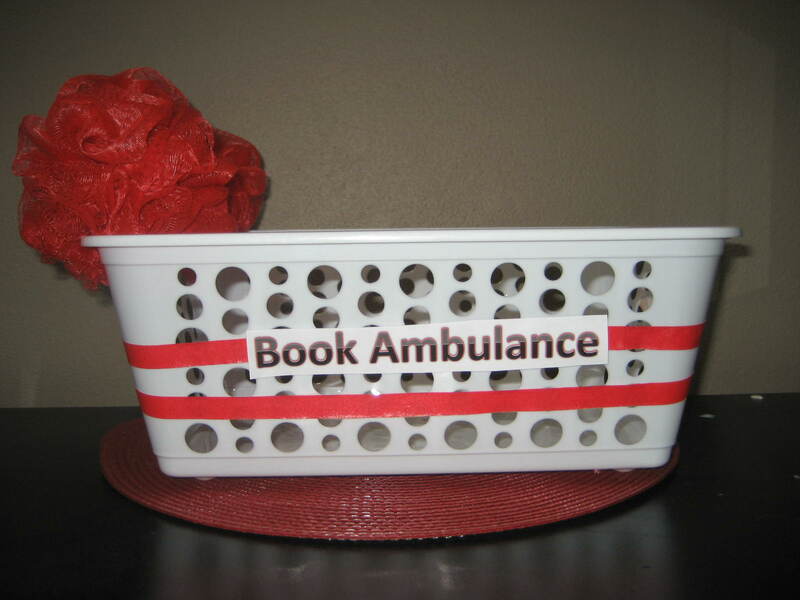 Create a book ambulance. No matter how careful kids are with books, you will have tears from time to time. Create a book ambulance to store these books until you get time to repair them. 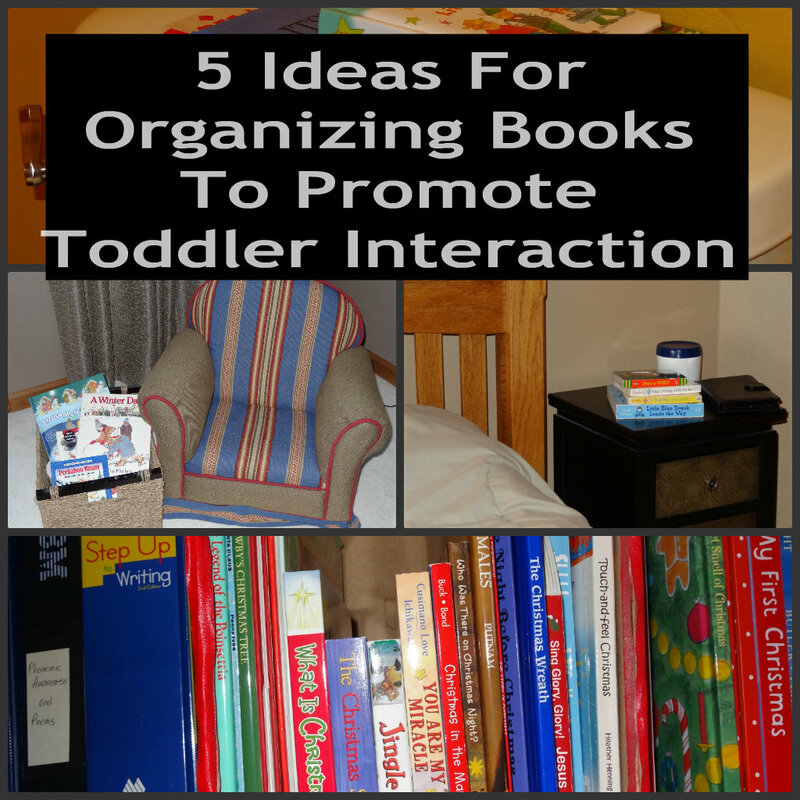 I hope these five tips help you create a house full of books for your kids. 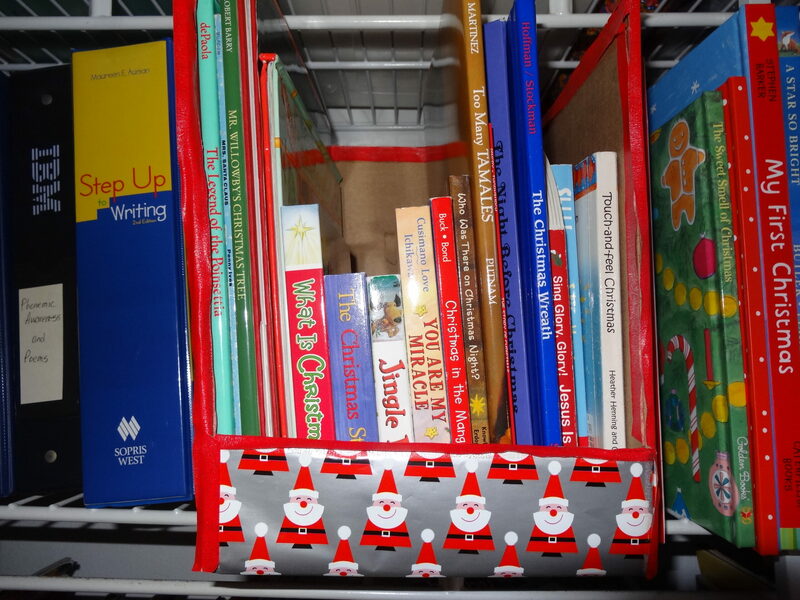 Do you have a book organizational tip that works well for your family or your classroom? Please share your ideas in the comments. Please see the linky party directory at the bottom of the page to see where this post has been linked. I LOVE this post! I often tell my clients to keep books accessible, and in baskets on the floor. In baskets they are easier to clean up and not as overwhelming. And having a spot for library books is essential! Love the kids chair. Who wouldn’t want to kick back & read there =-) Thanks for linking up to TGIF! Have a great week…. see you again Friday! Thank you for sharing these fantastic ideas! I recently discovered your blog and can’t wait to read more! What great ideas! We also keep a bag of books for the car. It’s nice to have books to read in the car plus they’re easy to grab if we end up having to wait somewhere. I agree that keeping books in the car is essential! What a great post! My aunt just gave me a new bookshelf for my daughter. I plan on rotating different themes in and out, just like the library and book stores. Thanks for sharing. I adore your book ambulance idea – I definitely need to incorporate that into our home! Thank you. My mom made that chair for my oldest son and he loves it. I love the idea of a book ambulance! Thanks for sharing at The Children’s Bookshelf.